Spray a baking sheet with cooking spray, then line with a sheet of parchment paper (the spray just helps the parchment stick to the tray, so it doesn't move around as your spreading the meringue). Place an 8-inch springform outer right (without the bottom part) in the centre of the baking sheet. (Alternately, draw an 8-inch circle in the centre of the parchment to use as a guide.) Set aside. Using an electric mixer and a clean, narrow, deep bowl or the bowl of a stand mixer fitted with the whipping attachment, beat egg whites and cream of tartar (or salt) on the highest setting until soft peaks form (using a narrow deep bowl ensures the beaters are well into the whites and will build up the greatest volume). Add sugar, 1 tablespoon at a time, without stopping the mixer, beating constantly until thick and glossy. Add 3 tsp of cornstarch with the last tablespoon of sugar. Whip mixture until sugar is completely dissolved. Dissolving the sugar should take about 10-12 mins (or if using normal granulated sugar, about 15 mins.) Test the mixture by feeling a small amount of the meringue between two fingers if it is grainy beat longer. Once the sugar is dissolved, use a rubber spatula to fold through vanilla and vinegar in a few, quick strokes. Spoon meringue into the springform cake ring and shape the uncooked meringue using the springform cake tin as a guide into one giant meringue. Make a slight indentation in the top, pushing the extra meringue towards the edges. You want it just slightly dished. This is where your lemon curd will go, so you want the edges higher, so it stays put in the middle. Carefully lift the springform cake pan ring straight up and remove. Place the uncooked meringue cake into the oven. IMMEDIATELY REDUCE OVEN TEMPERATURE TO 210F. Bake for 1 1/2 to 2 hours or until dry and crisp, test by tasting a teaspoon of the meringue from the top if it doesn't taste of egg it is done don't worry about the small hole made by this testing it will be covered by the topping. Test at 1 1/2 hours and then every 15 mins until ready. Turn off oven and leave in oven to cool completely. (pavlova may sink and crack during cooling). 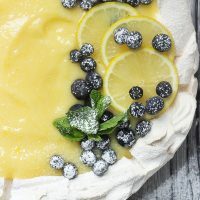 To serve: (Put curd on meringue just before serving) Spoon cooled lemon curd on top of meringue and spread evenly in the indentation, leaving the outermost edges uncovered. Arrange some lemon slices around one side. Top with a scattering of fresh blueberries and some fresh mint leaves. Dust with powdered sugar, if desired. Would also be nice with a dollop of whipped cream.